Given some of the waistlines you see around Dallas, it's clear that we're no strangers to answering "Yes" when asked "Do you want fries with that?". Also, sometimes we want fries all by themselves. Or with a side of queso. The point is, we want them. Here are the best places for French fries you'll find in Dallas, worthy of accompanying a burger or being the star of the show. There are fries, and then there are the duck fat fries at The Blind Butcher. Then there's what happens when Blind Butcher takes those duck fat fries and makes a poutine with smokey gravy, cheese curds, and pork belly. If you're cutting back on pork for some religious or insane reason, you can opt for a duck confit version (that you can amp up with foie gras), a shrimp number with lemon-parsley curds, or a meatless mushroom version that remains delicious. Well, meatless except for all that tasty duck fat. Skinny, crispy, perfectly salted potato goodness -- yes, Hopdoddy puts out some incredible hand-cut fried spuds that need nothing else to make them delectable. But that doesn't mean adding more stuff isn't fun. Get 'em truffled, garlic & herbed, or with a helping of addictive green chile queso, which makes for a match made in heaven. 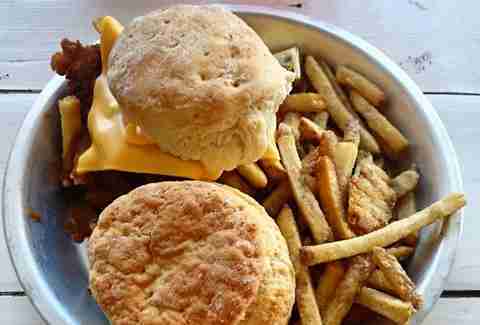 And heaven is where you may soon be headed if you keep eating like this... but don't worry about that now. On with the fries! 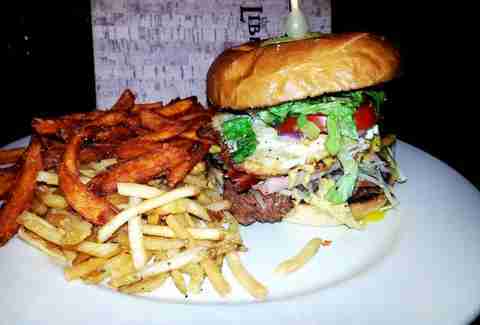 Okay, so technically LA Burger has regular French fries, but that's not the reason you came here. 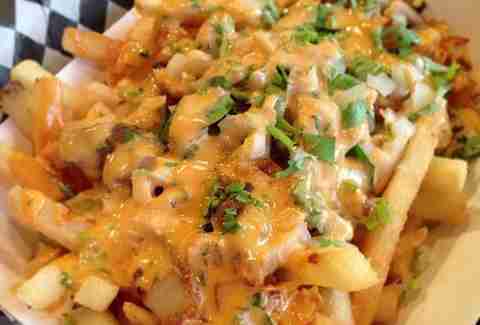 You’re getting the K-Town fries. Skinny, crisp fries are topped with bulgogi (beef, amazing); or if you like a bit spicier, you can ask them to throw on the dejigogi (pork, also amazing). Either way, you're also getting house-made kimchi, cheese, cilantro, onion, and a spicy sauce that drips down from the heavens. They are probably big enough to share. You are probably not going to feel like it. 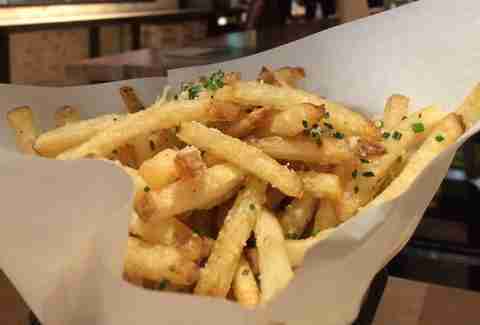 Goodfriend is known for their great burgers, drinks, and beer selection -- but that doesn't mean you can overlook those perfectly cooked waffle fries. 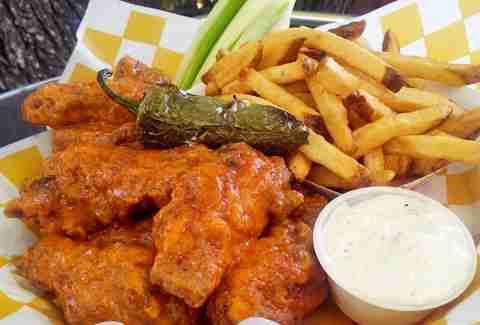 Perhaps you'd like to try dipping them in the Buffalo sauce, or their Ghost Chile Ranch? Another strong decision would be getting the cheese fries. Waffle fries smothered with cheese, scallions, and bacon with a side of ranch... it's basically a baked potato you can eat with your hands. These hand-cut, well-salted taters make for the perfect companion to the excellent local beers you'll be throwing back on one of Dallas' best patios. They're simple and perfect, but if simplicity isn't your thing, the jalapeño-bacon-ranch loaded version can be quite a fun time as well. 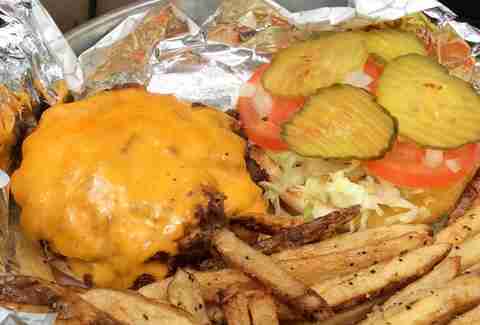 Another spot known for burgers... but then, you'd hope burger places would be bringing it hard with their fry game as well, wouldn't you? The fries here are on the thicker cut side, with just the right amount of fluffy potato interior resting beneath the crisped outside. As for condiments, you need both the special sauce and the habanero ranch. Both. This is not up for discussion. Stackhouse is like Burger King, in the sense that you can "have it your way" and they serve burgers. But that's about it. You can get their fries plain and simple and be quite happy about it. You can get cheese fries and get excited when you find out that it also involves bacon, scallions, pickled jalapeños, and ranch. 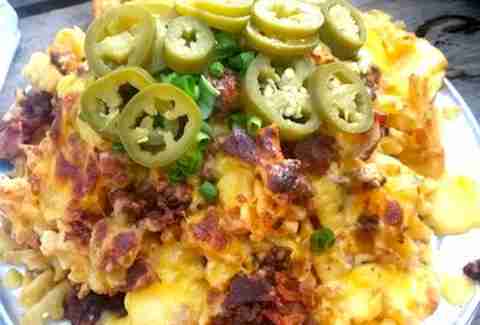 You can get chili cheese fries and get some more protein in the mix. 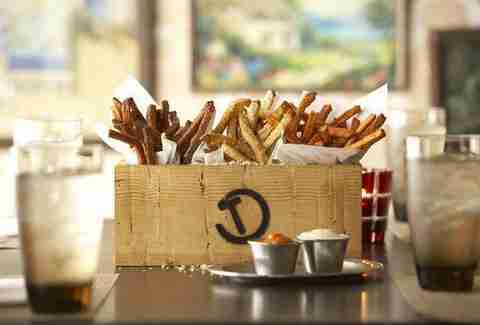 But the sneaky good move here is the sweet potato fries; a little thinner, a little crispier, and a lot addictive. If you have room, grab an oatmeal cream pie at the end. You totally earned it with the restraint on the sweet potato fries. 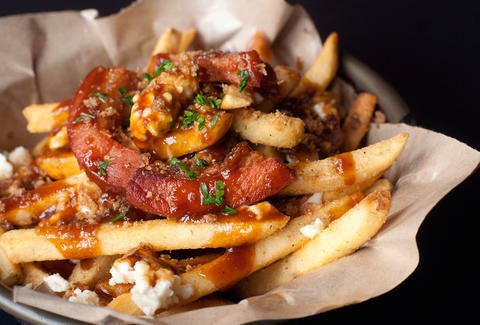 While we’re on the subject of fries different ways, let’s chat about Tillman’s Trio of Fries. That’s French fries done in three distinct styles; Parmesan & black pepper Kennebec, a chile & lime russet, and bourbon-sweet potato fries. The trio is served with house-spiced ketchup and horseradish pickled mayo. If you really feel like living dangerously, get the chicken-fried steak as well. Chicken Scratch has quite a bit going for it: a massive picnic table'd patio, old shipping containers serving as private dining lounges... oh, and amazing french fries. Changing things up just a hint, they add a touch of sugar to strike an addictive sweet-salty balance. They also let you dip them in seemingly any condiment under the sun... home-made ranch, salsa verde, beer mustard... but the real holy grail here is the fried chicken gravy. Also an acceptable move: everything. 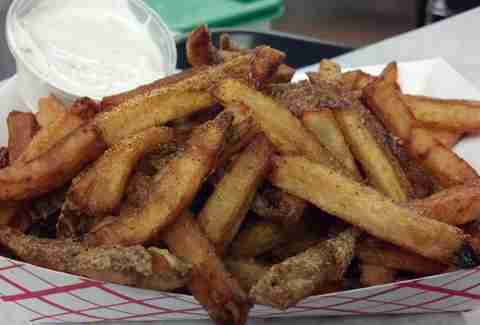 Vagabond is also in the duck fat fry game (like Hansel, they are hot right now). Pillow-soft on the inside with a rich browned exterior, they're positively other-worldly when combined with a bit of their garlic mayo. Yes, mayo. Why are you fighting it at this point? This is another place where sweet potato is the move. The regular fries are good too, but sweet potato is where it’s at. These beauties are thin-cut and perfectly sweet on their own without added sugar, and with the just right amount of salt. 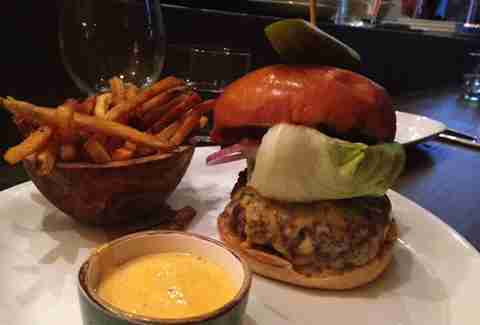 The Libertine’s sweet potato fries are basically famous in a Madonna or Prince kind of way. You don’t have to use the full term "sweet potato fries", you can just say "fries" there and people will probably know that you mean the sweet potato variety. Yep, that’s how good they are -- if you haven’t had them you should find out for yourself.